Centrify is one of the leading directory extenders in the market. Still wondering what directory extensions are and what they do? Well, they extend the user credentials found in Microsoft’s Active Directory (AD), enabling them to function on other types of devices. These devices usually include Macs, Linux, and iOS and Android mobile endpoints. The theory behind directory extensions is that one set of credentials can be leveraged across all platforms. Because Centrify serves this purpose and has the ability to serve Mac and Linux devices, JumpCloud’s Directory-as-a-Service® is often compared with it. Centrify has been around a long time and is a very successful company. They focused on an emerging market, which was centered on extending Active Directory, a decade ago. Microsoft’s directory services solution, Active Directory, was gaining significant market share at the time. And while Macs and Linux devices were not that prevalent, they existed within some organizations. Centrify’s focus on extending Active Directory met an important need at that juncture. As the use of Macs and Linux device increased in organizations, the market for Centrify’s solutions increased, too, and the organization grew rapidly. Centrify’s most common solution is an on-premises piece of software that attaches to Active Directory. They offer a cloud-based service as well. Centrify’s target customers have been large-scale enterprises. JumpCloud’s Directory-as-a-Service can look similar to Centrify in some ways, so it is understandable how the two may be compared. JumpCloud’s Active Directory Bridge can also extend AD to Macs and Linux devices. JumpCloud’s DaaS provides authentication support and device management capabilities across all three major platforms – Windows, Mac, and Linux. While Directory-as-a-Service can be leveraged as a directory extender, it’s primary use is as a full-service Identity-as-a-Service platform. JumpCloud functions as an organization’s core identity provider rather than an extension to AD. As more organizations look to move away from AD, serving as the core cloud-based directory service is a valuable function. Directory-as-a-Service authenticates, authorizes, and manages users to the IT resources they need, leveraging a variety of different protocols in the process. JumpCloud’s Directory-as-a-Service functions as an LDAP endpoint, SAML single sign-on service, cloud-hosted RADIUS server, and more. Devices can be locally managed through APIs. DaaS ultimately serves as the core user management platform rather than as an extension. 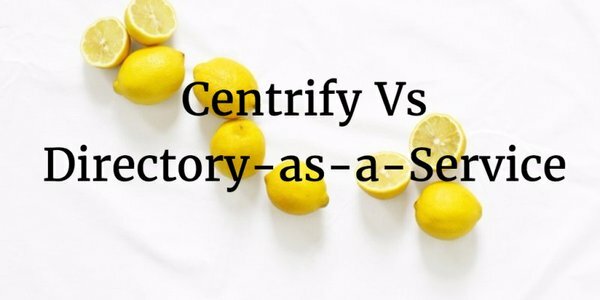 If you would like to learn more about how Centrify compares to JumpCloud’s Directory-as-a-Service, drop us a note. We’d be happy to discuss it with you.